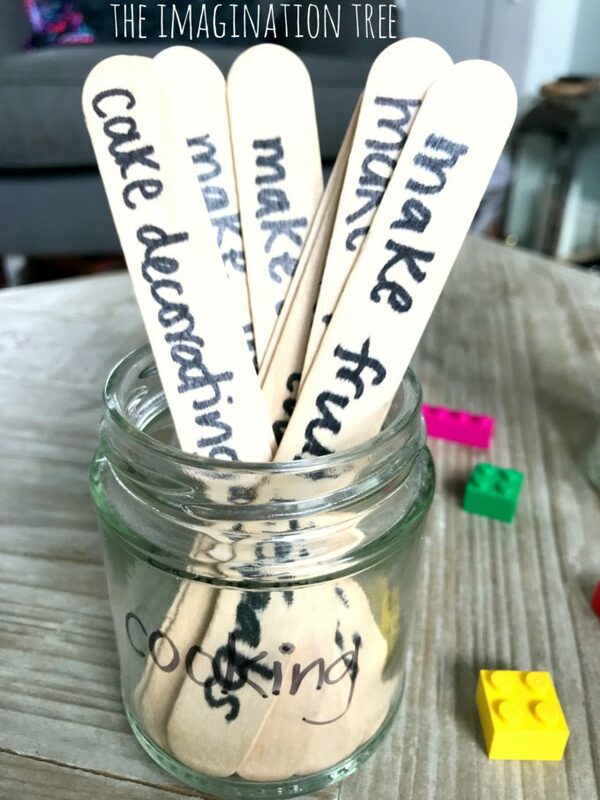 Make some activity jars for busy kids this summer! 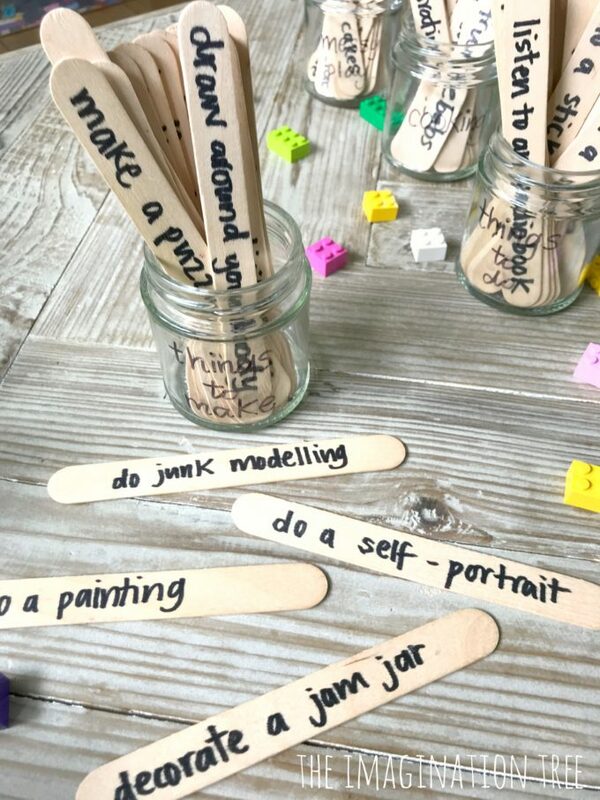 No more “I’m bored!” or “what can I do now?”, these activity jars are packed full of simple, easy to prepare ideas to help kids make their own choices, direct their own play and keep busy throughout the school break. Yay! 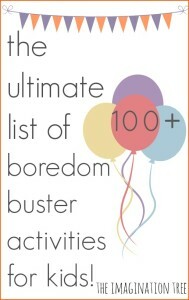 Before I write about this simple activity idea I will just say that I am a BIG believer in giving kids lots of free time in which it’s ok to be bored and find their own ideas for things to do. Too often we feel pressure to schedule every minute of their free time and in so doing we take away the opportunity for them to learn how to plan and direct their own time and use their imaginations. It’s usually during the most “boring” of days that my children will, eventually, come up with amazingly creative games, elaborate Lego models or write stories and paint pictures. However, the summer holidays are a particularly looooong period of time to fill and everyone can feel under each other’s feet at times! 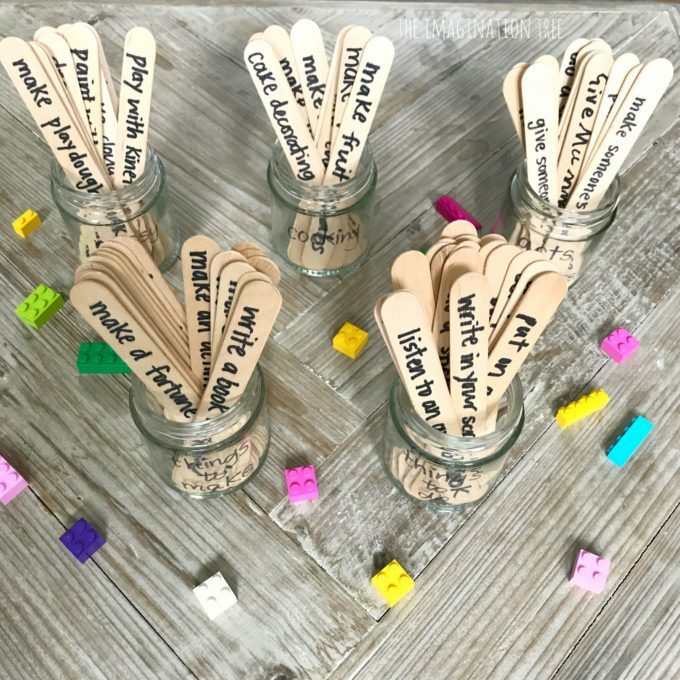 I can’t stand hearing the kids whining about what we are doing next or ideas for games to play, so together we sit down and make a HUGE list of all of the things they generally love to make, play and do and then use those to create these Activity Jars. 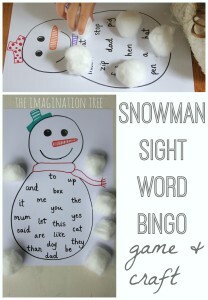 We actually made these last year but as usual with my time on this blog, I hadn’t managed to share them here yet! We have added more ideas to them over that period and I love how it’s as much their ideas that have been inputted into this as mine. In general these activities are a good fit for approximately 3-11 year olds (I currently have a 3, 6, 8 and 9 year old in the house!) If you have only toddlers or only older kids,obviously you’d adapt these ideas to suit your own family situation. 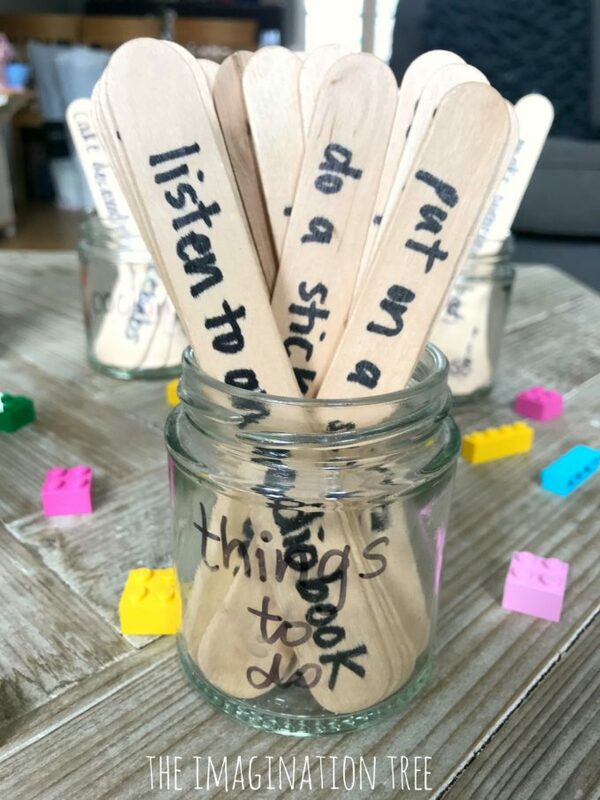 Next, spilt up the lolly sticks into piles (around 10-15 per jar is plenty), then brainstorm ideas of the simple things you love to do with the kids in each category. 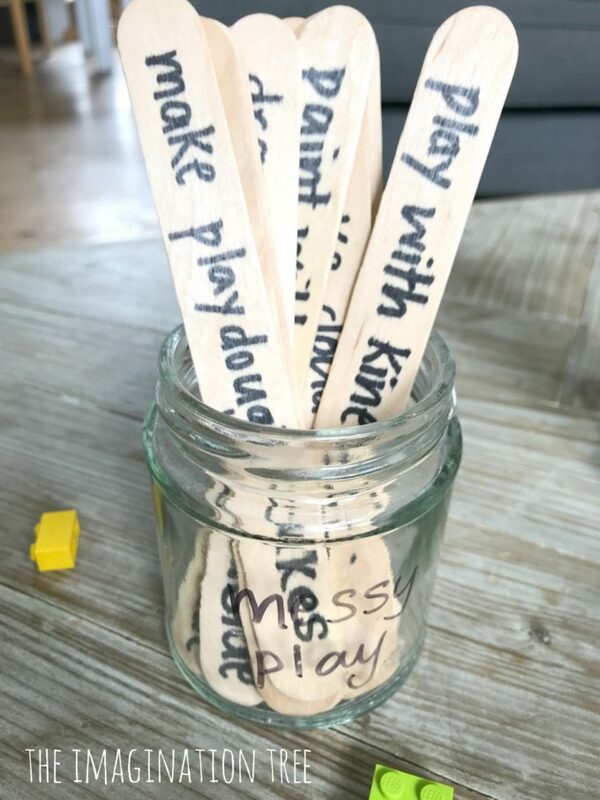 It’s really important to have their input here as you want them to use these activity jars as an independent play prompt, so they must be engaged in the process if possible! 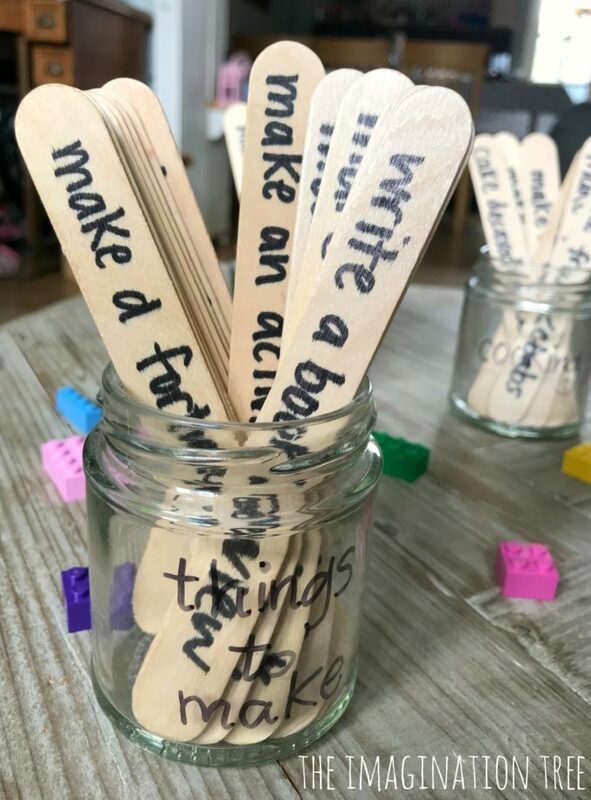 Then write on to each stick using a Sharpie marker and drop it into the appropriate jar. DONE!! To get you started with ideas, here’s what is on our activity sticks! We have a LOT of these sensory play materials already made and stored in zip-loc bags or tubs in a drawer, ready to play. They also know how to make slime and play dough independently. Perhaps prepare some of these things in advance to make this jar easier to go! Also, click the bold links to go straight to all my recipes. Start here with my SENSORY PLAY ARCHIVES for ideas and links too! As you know, I also have my own book and small business promoting Acts of Kindness in children called The Kindness Elves! I am a huge believer in acts of kindness being as important as maths, literacy and science and that we should be actively teaching and guiding our kids to show kindness to others in daily life. I have written a huge eBook called Camp Kindness which is jam-packed full of activities and acts of kindness ideas for kids to keep them busy throughout the summer holidays, with things to print and use alongside the Kindness Elves as a sweet and playful prompt for the whole family. You’ll find LOADS of acts of kindness ideas in that and I hope you’ll be inspired to join us! 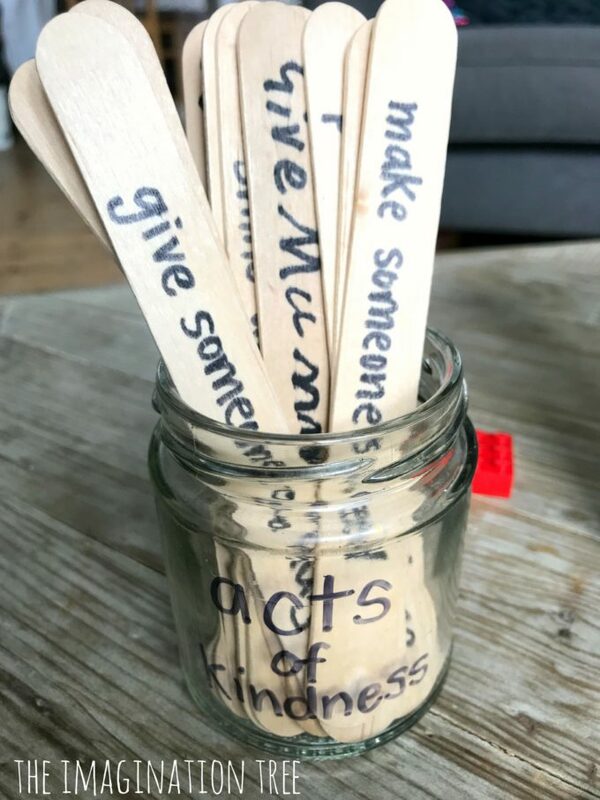 Here are a few of those kindness ideas that we use in our Acts of kindness jar, but this is just a little taste of what you’ll find as part of our Kindness Elves tradition! With all the jars made we simply keep them out on the side in the dinging room and any time they start to ask what to do next I remind them of the jars we made and they go and have a look through for an idea that appeals. 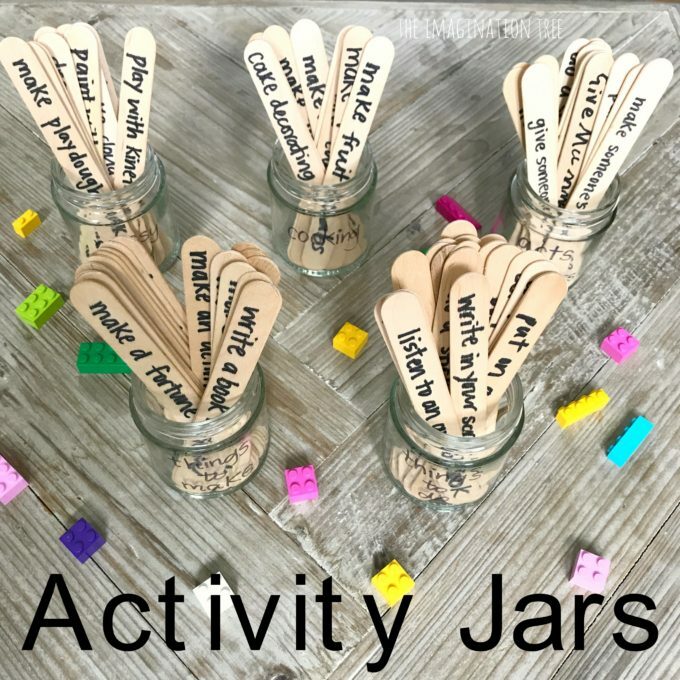 These Activity Jars for busy kids have TRULY been a great help to me whenever we have a rainy day or school break, mostly as they remind us of all the fun things we can and have done in the past and are just a great memory prompt for activity starters. Often times they choose one of these and then the play or creativity leads on to something else, which is brilliant! We sometimes then add that new idea onto a new lolly stick and add it to the jar too! 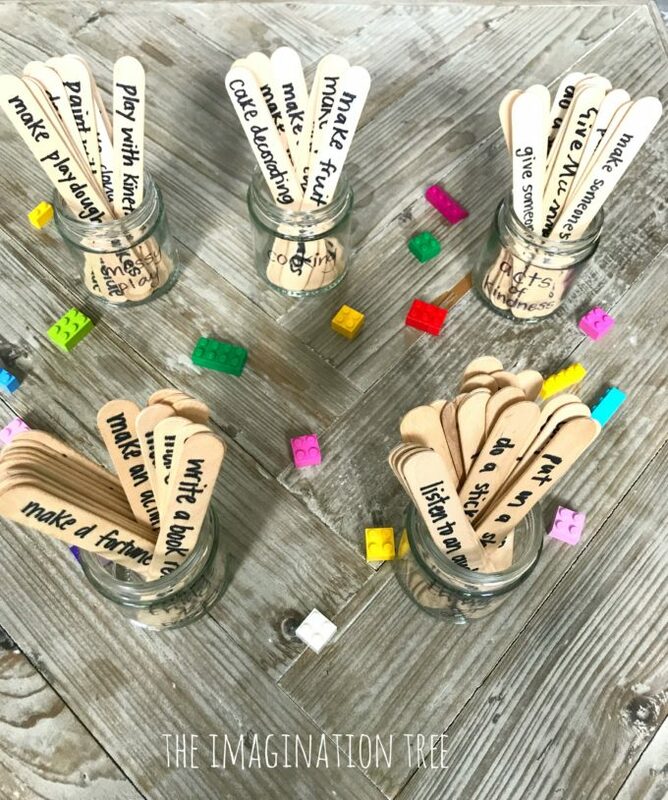 If you loved this Activity Jars for Busy Kids idea PLEASE share it on social media and also comment to let me know how you got on with making it for your own family! We use a Boredom Jar too. Ours has slips of paper in it with ideas on. 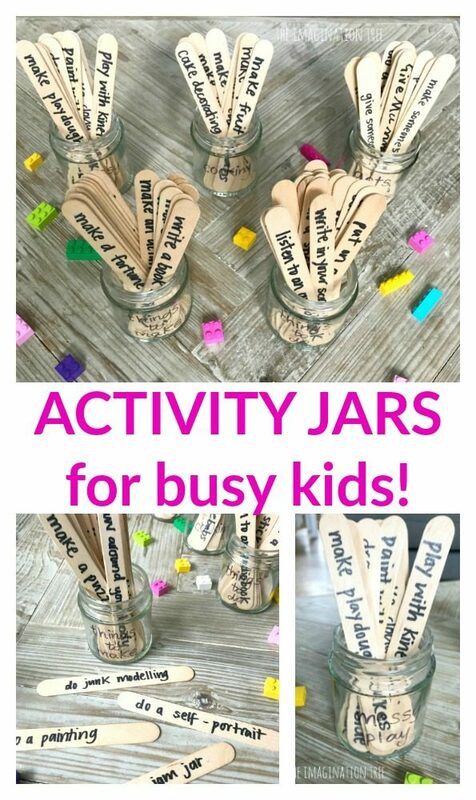 I hadn’t thought of splitting the activities into different jars for different activity types. That’s a great idea.